The Blogger’s Brunch at Park 75 at Four Seasons in midtown was thrown by Executive Chef Robert Gerstenecker and his staff and Marsha Middleton and Abby Moreland of MSquared Public Relations. The pictures are courtesy of Foodie Atlanta. How many wonderful things can you find in the following sentence? At Park 75, Chef Gerstenecker and his crew make their own chocolate and use the resulting cocoa bean hulls as mulch for heirloom vegetables that grow in their roof-top garden that is also home to two beehives. Now that’s a commitment to local food. And the resulting chocolate is risky to eat while standing up. It’s knee-bucklingly good. Two floors up from the Park 75 kitchen is a roof-top garden and apiary, which is clearly not only close to the kitchen but also to the hearts of Chef Gerstenecker and Sous Chef Bryan Beneke. The garden beds are home to peppers, eggplant, tomatoes, potatoes, sweet potatoes, zucchini, basil, mint, bay, and more. There’s also a bed (pool?) of hydroponic lettuce. The heads of romaine have beautiful, deep colors and look understandably pleased with themselves lounging about in their roof-top pool. 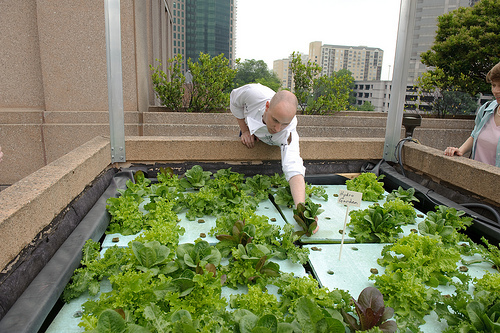 Sous chef Bryan Beneke reaches for a head hydroponic lettuce. 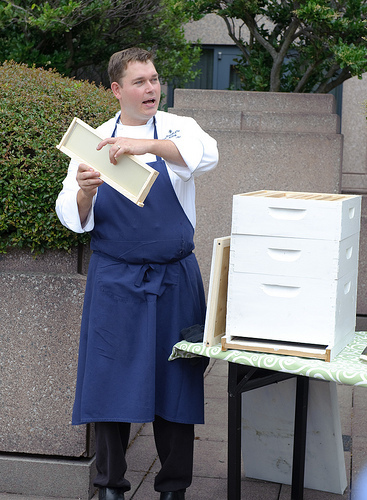 Turning to the beehives, Chef Gerstenecker held up one frame that held four pounds of honey – and there were 15-20 frames in that one hive. Chef Gerstenecker shows us the honey. Being around the bees was oddly soothing. It reminded me of scuba-diving: you’re in a situation where it makes sense to panic, but once you decide not to panic, you feel very calm instead. Grapefruit-Basil-Lime Lemonade. How good was this? It made me forget all about the Bloody Mary I was served the minute before. One half-second sip of lemonade yielded two seconds of unfolding flavors. That’s a heck of a ratio. Athens Benedict. 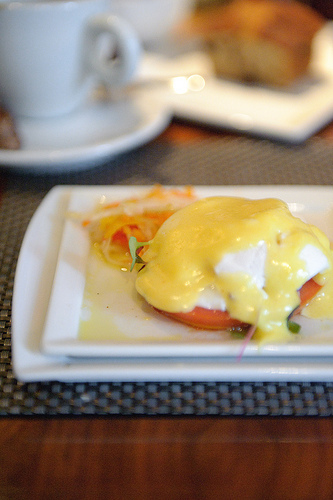 This veggie Benedict consisted of a sliced tomato and micro-greens along with the requisite, and exquisite, poached egg and hollandaise sauce. It’s all too easy to slide into heavy and indulgent at brunch, but with this dish you can indulge without the heavy. Seared Scallop and Spring Vegetable Risotto. 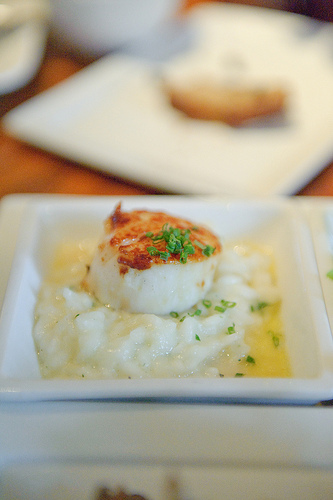 The seared scallop was perfectly done, and, surprisingly, the risotto underneath was its match. Rich and creamy with lovely flavors. Doughnuts! Ever met a graceful doughnut? Well, they exist at Park 75. I had a chocolate doughnut and a chocolate-covered Boston cream doughnut. There were also glazed doughnuts and cinnamon doughnuts, but having tried some chocolate earlier, I knew what to grab (in a most refined manner, of course). Thinking more clearly now, it would have been nice to try a glazed doughnut in order to separate the doughnut experience from the chocolate experience. But there’s a time for analysis and there’s a time for gluttony enjoying the most of what’s offered. Even if you don’t live in town, Four Seasons is easy to get to on 14th Street just off the connector. Moreover, the hotel offers complimentary valet parking to Park 75 patrons. 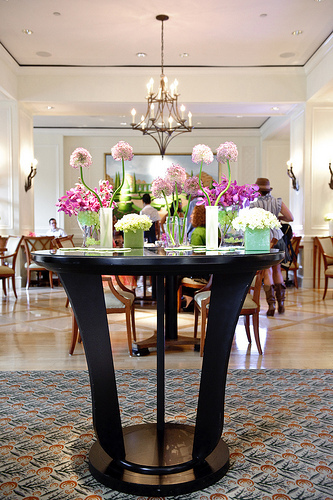 Park 75 serves breakfast, lunch, and dinner as well as brunch and afternoon tea on the weekends. Visit Park 75’s website for times, menus, and to make reservations. Looking for a Father’s Day brunch? 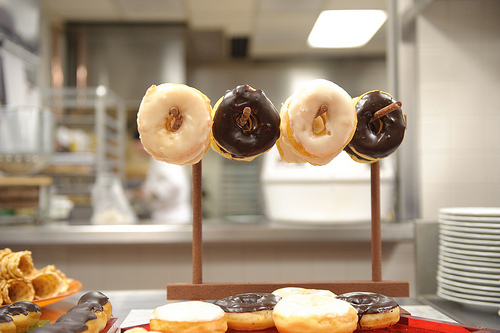 Try “Doughnuts with Dad” at Park 75 on June 19th from 11:00-2:00. What a fun day! I love that the chef believes in the same things we do – local food, prepared right. I’d love for you to have an apiary!